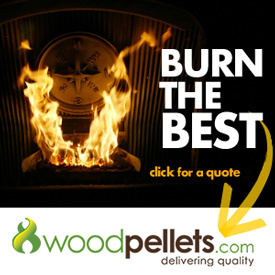 Wood Pellet Stoves have a variety of pellet hopper designs that store wood pellets and guide them into the pellet feed system. Wood pellet hoppers are generally accessed via a hatch on the back of the stove or, less commonly, by simply lifting the cover of the stove itself. Filling the hopper is an incredibly easy process. Open the lid and pour a bag into the hopper. It is a process that can be more difficult for smaller people and the elderly, as the hopper height is approximately 3 feet. Some find it easier to empty pellets into a large bin and use a bucket to fill the hopper. The hopper needs to be periodically monitored to ensure that the stove doesn’t run out of fuel. Some stoves (such as Harman and Jamestown) offer extension hoppers for some of their stoves, which enable upwards of 140 pounds of pellets per fill. While making it a little more difficult to fill, the larger the hopper, the less time spent filling over the course of a heating season. Depending on the hopper size and the temperature, the stove can burn unattended for many days without refueling.